In the Valley of the Temples stands this beautiful structure, "a scale replica of a temple at Uji Japan that is over 900 years old" called the Byodo-In Temple. 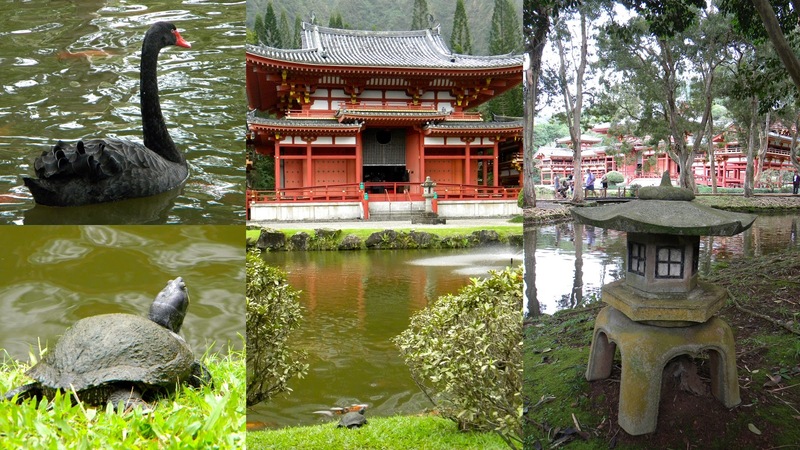 The Byodo-in Temple at Oahu was "built entirely without the use of nails in 1968 to commemorate the first Japanese immigrants to Hawaii. This temple represents the mythical phoenix, its wings upheld by pillars of stone. Folklore tells of the phoenix arising from the ashes to reflect the promises of hope and renewal." The 2,000 foot Koʻolau Mountains towering over the temple, this is one of the most beautiful places I've ever visited and no doubt will continue to visit every time I go home to Oahu. Here, I can hear the birds chirp and the bamboo trees sway and twitch. This is the perfect place to forget all your worries and stress. For me, it's a place I find peace and tranquility; it is worlds away from the busy, touristy Honolulu. Whenever I visit, I refuse to leave. Byodo-in's Bell house, also called as kanetsu-ki-do, contains a five foot high, three ton brass bell, called bon-sho (sacred bell), cast in Osaka, Japan from a mixture of bronze and tin...A soft wooden log called the "shu-moku" is used to strike the bell. The bell is customarily rung before one enters the temple to spread the eternal teachings of Buddha. Amida, a golden Buddha unique to the entire world....The Buddha is thought to be the largest figure carved since ancient times. Towering more than 18 feet, the immense figure is an original work of art carved by the famous Japanese sculptor, Masuzo Inui. When the carving was completed, it was covered with cloth and painted with three applications of gold lacquer. Gold leaf was later applied over the lacquer finish. The hall and all the artistry it reflects are regarded as representing the essence of the culture of the Fujiwara aristocracy. Graceful black swans swimming at the front lake and other wildlife enjoying the peace around the temple, like the turtle looking up at the temple. I'm wondering if the turtle wants to cross the lake and visit the temple too. The middle building which is the main hall, Hoo-do or the Phoenix Hall, because a pair of the legendary birds of good omen and of Chinese origin is seen perched on both ends of the roof with their wings spread and ready to fly away. the hall containing two wings reflects stability as well as artistic beauty. This is the stunning view that awaits as you step into the temple grounds. Frog fountain by the pond. 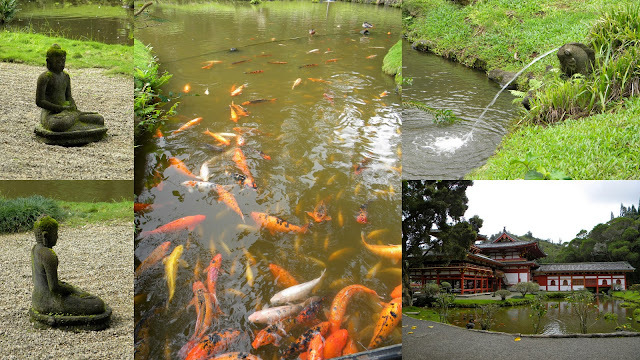 L-R: Buddha statue, the Koi Pond, view of the temple at the back. A view of the kanetsu-ki-do. A shot I took as we were leaving. Fog starting to come down as we were leaving. On the road again for another destination. If you'd like to learn more about the temple, info is here. - Everything in italics is from the Byodo-in brochure given when I visited the temple. It all looks so very peaceful. Beautiful photos. have you been here before? parang i've seen this in one of your posts..or i might be mistaken. anyway, it is a beautiful place. i know i'll love it there. it seems so realxing! gosh! It was really built without using any nails? That's amazing. black swans! bamboo graffiti! zen zone in hawaii! what a tranquil place, indeed! a place to really recharge your weary soul! It looks so serene no wonder you didn't want to leave it when you're visiting. The autographs on the bamboo look artistic. @ Grace, Yes, we visit the temple every time I'm at home for the new year. @ Daphne, It's true. I even went around the temple just to find if I could find any nail...they used wood to put it all together. @ faery, I agree. It's very tranquil place to make muni muni. @ wits, I, too, love the bamboo. Excellent photos, such a tranquil place. I have been there as well. This temple is only one of the many reasons I feel in love with Hawaii. This place looks so serene. I would love a visit here when time and finances permit! what a beautiful place! very peaceful. lagi mo talaga syang babalik-balikan. I love the "vandalism" on the bamboo. Second to the last p icture is just awesome. I wanna go there! Good to hear from you. Yes you can send it to that address. Please make sure you have my full name though. Please leave me your e-mail next time so that I can contact you. I will not publish your comment with the e-mail. beautiful place ;) thanks for posting this -- i can imagine how hard it is to leave home after the holidays and go back to work.. especially leaving the sun and the island and going back to cold and snow..